The Chinese palace can be deservedly called a treasure of the Oranienbaum's park. The name "Chinese" appeared inasmuch as in the 18th century, during the course of Catherine the Great, there was a great popularity of the Celestial Empire's art (chinoiserie style) in Europe and several halls of the palace were decorated with use of east motives. However, China's art was rather freely interpreted by the artists of that time. 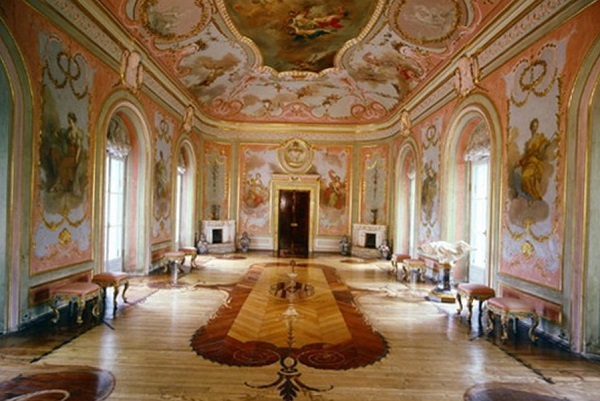 The value of the palace lies in the fact that there are remained original interiors of the 18th century (unlike other imperial residences of St. Petersburg that were destroyed during the Second World War). Supposedly that is why the Chinese palace is open to the public only in summer, at all other times it is closed because cold and wet air perniciously influences the interior materials. The Chinese palace is built in Verhnij park in 1762 - 1768. Originally the construction was single stage, and its originality was that the external design, as well as an internal decor was executed by one outstanding master - the Italian architect Antonio Rinaldi. The buildings were built in a style of rococo (as distinct from more magnificent and grandiose baroque) the distinctive features are: refinement, delicacy and discriminating taste. The Chinese palace was created not for formal receptions, but for the rest and entertainments of Catherine the Great and the pushed closer to her. The external design of the building was rather reserved and by sight it reminded rather the summer pavilion, than a palace. At the same time, internal furniture surprised with its beauty and luxury. In total there are 17 halls in the Chinese palace. The people danced there, played cards and arranged feasts. At that, each room was executed in original way and differed from all others. As a decor were used gilding and mirrors, molding and fresco. 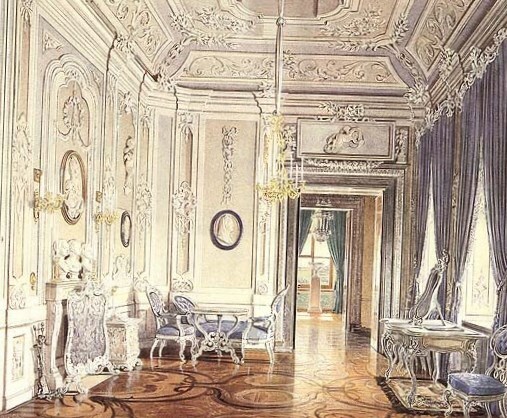 The ceremonial enfilade (the primary axis of the building) includes the Hall of muses (Zal muz), the Blue drawing room (Golubaya gostinaya) and the Parlour made of tubular glass beads (Steklyarusnyj kabinet), the Big hall and the Lilac drawing room (Sirenevaya gostinaya), the Small( Malyj) and Big (Bol'shoj) Chinese parlour. parlour), in western - the chamber of Catherine the Great (The Chinese chamber and Portretnaya, Tualetnaya i Kameryungferskaya room - the room for waiting-lady's duty). For execution of halls in east style many objects of art were delivered from China and Japan. In the palace there are found objects of the 18th century – the picturesque cloths and collections of porcelain brought from the East and from Europe, the carved gilded furniture created by the Russian carvers and gilders according to Rinaldi's drawings. The special focus is deserved by the parquet identifiable by the variety of drawings and color scale. 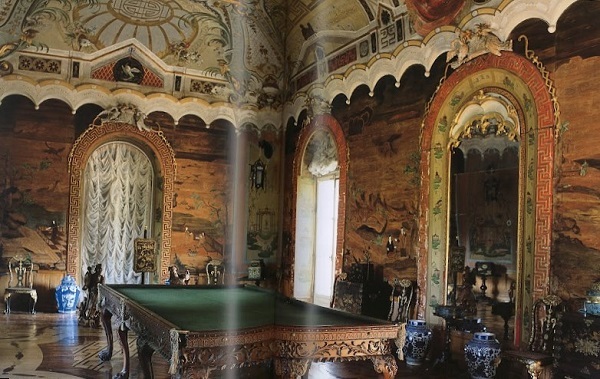 Originally the floor in rooms was made from marble, and in 1770 it was replaced by the glued-laminated parquet for which creation they used more than 20 species of wood, among them - a red tree, ebony and brown tree and also boxwood, amaranth and Persian walnut. The Chinese palace was the summer residence of the empress Catherine the Great and constituted a part of a complex under the name "Own Summer camp" ("Sobstvennaya dacha"). Initially the building was small and it was called the Lodge (Domik) the proper of her imperial greatness and also the Dutch lodge (by analogy with Monplaisir in Peterhof). The structure was initially planned as the lonely pavilion in the secluded place and therefore it was not visible from far away. The avenues leading to it are arranged in such a way that the palace surrounded on every side with arose absolutely unexpectedly in front of the guests. 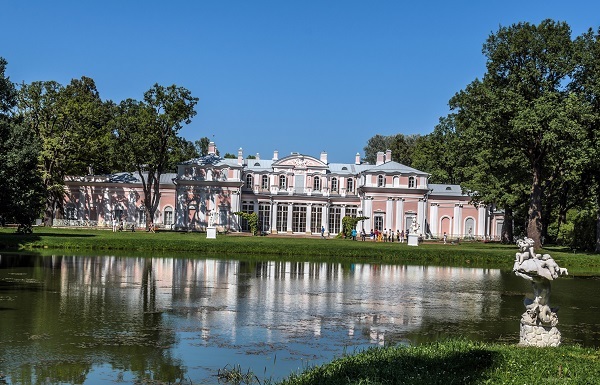 As a rule, Catherine the Great came to her Own garden of Oranienbaum with a retinue of guests of note who viewed the halls, admiring their interiors. At the same time, the palace building was not comfortable because all rooms in it were located on the level of a ground and there was felt a dampness in them. Fireplaces were made of artificial marble and they could not be kindled strongly. Halls of the Chinese palace were not adapted for long stay of the guests, and they were used only for informal receptions. 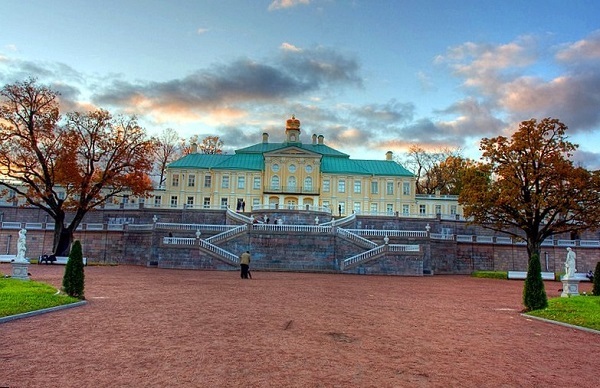 Usually after the visit of Oranienbaum guests came back to Peterhof - the ceremonial residence and if someone remained to stay overnight, they occupied rooms in Menshikovskij Palace. The bedchambers of Catherine the Great and Pavel Petrovich's also were not used for sleep. In the middle of the 19th century the Chinese palace changes its visage – the building became higher on the floor, the gallery that connected two projections (bleeding side pieces of a building) was arranged too. The internal decor also changed, but despite all the transformations, construction kept its distinctive character and originality. In 1922 in the Chinese palace was organized the museum open for general public. 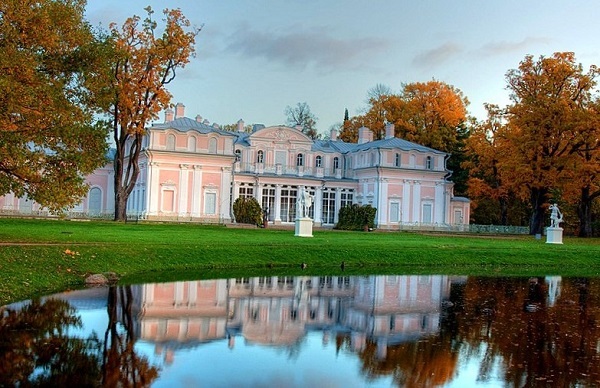 In wartime Oranienbaum was not occupied and therefore in post-war time it was the first opened from the list of suburbs of St. Petersburg. In 2009 began a large-scale restoration of a listed building. Restoration of fragments of a unique decor is carried by virtue of the inventories and watercolors remained since 1901. Antonio Rinaldi built a construction practically on the ground, and the high humidity constantly destroyed furniture of the rooms. To retain unique interiors, during reconstruction for the first time in 250 years was arranged heating of the building, and special sensors were installed in all restored halls. With their help the temperature and air humidity cab be controlled. Now the rapid change of external temperature is not terrible for the interior - in winter time the Chinese palace is heated, the optimum air humidity and temperature of 4,5 degrees are maintained. The Chinese palace is the exclusive monument of the Rococo style in the Russian architecture. The architect Aleksandr Nikolaevich Benua compared the decoration of a building - its design and ornaments, pictures and architectural details, with the sonatas of Haydn and Mozart. Catherine the Great called the Chinese palace "a cassette with jewels".